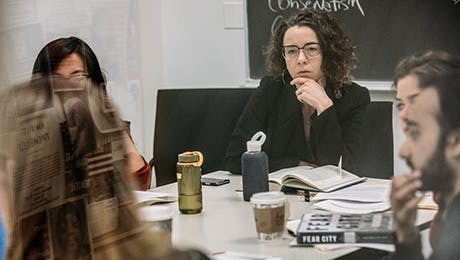 The PhD in Philosophy is designed for students who have completed the Philosophy MA at The New School for Social Research or a comparable master's degree from another university. The PhD provides maximum flexibility, enabling graduates to develop the highest level of competence in their chosen field of scholarly specialization. PhD candidates must earn 30 credits in addition to the 30 credits taken in the Philosophy MA program, for a total of 60 credits. Transfer students who already have an MA in philosophy (or its equivalent) from another institution may be assigned credit for all or part of their previous graduate studies up to a maximum of 30 credits. Of the 60 total credits required to earn the PhD in Philosophy, a student must complete 48 credits in philosophy courses, and up to 12 credits in fields other than philosophy. Of the 48 philosophy credits, the student must earn at least 15 credits in philosophy seminars. The Philosophy department does not require a specific program of courses. However, students who do not satisfy the core course requirements prior to receiving the MA must satisfy these requirements, including the required course in logic, subsequently. At least a 3.0 grade point average must be maintained in the philosophy courses as well as overall. The candidate for the PhD must demonstrate a reading knowledge of an additional language to that required for the MA. The second language will be chosen from French, German, Greek, Latin, or (by petition) another language relevant to the student's dissertation. During their final year of course work, PhD students typically complete the year-long Prospectus Seminar. Upon completion of all course requirements, PhD students proceed to PhD candidate status by passing the PhD qualifying examinations: the PhD Area Exam and two PhD Qualifying Papers. The PhD Area Exam is a comprehensive exam completed after Prospectus that is designed to help students begin writing the dissertation. Students prepare for the exam by studying a list of texts that their supervisor and a second reader believe are necessary for the student to begin writing, which forms the basis of the exam questions. The PhD Qualifying Papers are article-length essays that two faculty members have certified as publishable inform. The purpose of the Qualifying Papers is to give students experience with writing professionally in the discipline of philosophy. The written dissertation and its defense in front of a committee of four faculty members constitute the remaining requirements for the PhD. A full account of degree requirements and procedures is contained in the Philosophy departmental handbook.